There is magic out here I can never explain. Evenings are my favorite, after everyone has left. I can leave the obligations and demands of the day behind and return to my porch swing and wait for the world to come alive. The amazing part about living here alone is that it feels like every night’s show plays out just for me, but the truth is it isn’t for me at all. It isn’t for any of us. Therein lies the magic. Whoever said country life was quiet was lying. It is a cacophony of frogs and birds and cicadas, of the neighbor’s ever vigilant hound dogs and a distant herd of cattle. It is a battleground for a war waging between two hummingbirds that nest in neighboring trees, appearing out of nowhere with a startling buzz to chirp and fight for the red liquid that is suspended above me, dispensed through tacky plastic flowers. Eventually, like clockwork, a doe and her twin fawns take the stage, passing through the pear orchard and picking their way up the hill. The doe pauses to rise up on her hind legs, plucking the still sour pears from the lower branches of the trees, and her twins clumsily copy. The fawns are growing up before my eyes, losing their spots and trailing farther behind mama before sprinting on spindly, comical legs to catch up. I have developed an unhealthy attachment to these two, who will inevitably leave me and their mother and find their way to the nearby highway, or into the path of a hunter’s rifle. But each night I wait nervously for them to pose atop the hill, and breathe a sigh of relief to see their black silhouettes against the sunset, bounding like shadow puppets across the horizon. How do I explain the magic of Friday night’s rain, that fell upon the farm like a baptismal cleanse. Earlier that day we swam through swampy air, desperately gasping for oxygen, dreaming of gills. After the rain I walked to the mailbox refreshed. Fog rose off the fields, mist hung in the trees. It was a world transformed in a way I wished I could bottle up and drink each morning. There is something freeing in learning how the world goes on around you. Without you. We humans are egocentric creatures, and it is surprisingly startling to be reminded how little most life on earth cares about us. The hummingbirds don’t think about me. The frogs don’t even know I exist. 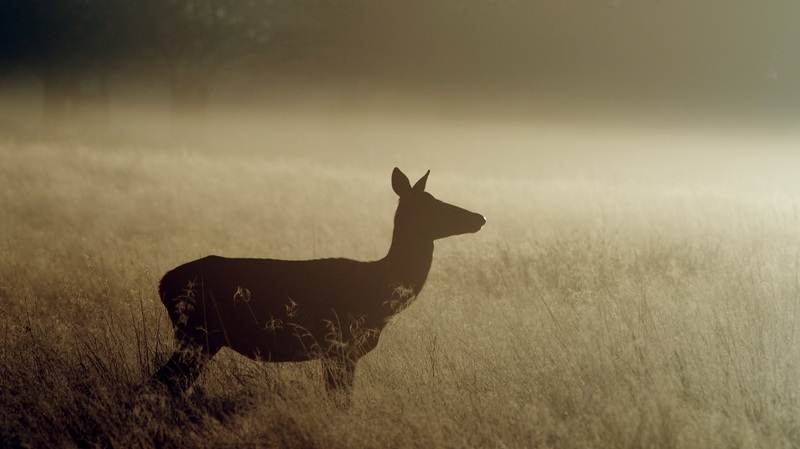 The twin fawns that I hold so dear, that I look for every night, that I refer to in conversation as “my fawns,” know me only as a strange scent drifting toward them on the breeze. I can’t explain it. It’s magic.